MAB: What’s the best piece of advice you’ve ever received? What advice would you like to pass on to others? TR: I don’t really hold much with advice. There’s a story about a Rabbi that was famed for his wisdom and insightfulness. He kept two scraps of paper, one in each of his pockets, and his pupils had often seen him consulting them but nobody knew what they said. These pieces of paper were of enormous interest amongst his pupils, and each had a theory about what might be on them. The pupils were confused because these writings seemed utterly contradictory and so after some discussion they asked their teacher which, if either, was really true and which held the greater wisdom. That’s how I feel about advice, I guess. That at best, it’s good for one pocket. But I did learn a really important lesson in 2012 when I caught the noro-virus and was as ill as I have ever been. So if I have to give you a single piece of advice from 2012 it would be: “Don’t get gastroenteritis.” (I think your readers probably call it a GI infection.) If I had to give you a single piece of advice from 2013, it would be “If you get the chance, go and see Venice.” We’ve just had our honeymoon there, and it was magical. One life lesson a year. I think I can about cope with that. EXCITING EDINBURGH FRINGE NEWS! 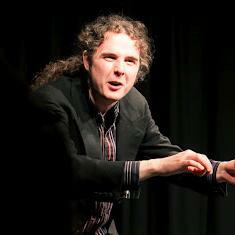 I will telling my show of Urban Devil stories, Rebranding Beelzebub at The Banshee Labyrinth during the Edinburgh Fringe Festival in August this year. Big shout out to the PHB Free Fringe, without whom this wouldn’t be happening. It’s going to be amazing! Follow the show on twitter by looking for #DevilTM and I’ll keep you updated here with developments. If you’re in Edinburgh for the festival then let me know. It will be my first time at the festival and it would be great to meet up and support one another.